According to an Industry Notice posted on the U.S. Department of State’s Directorate of Defense Trade Controls (DDTC) website, effective Monday, April 20, 2015, the Office of Defense Trade Controls Licensing (DTCL) will undergo a reorganization. Export Control Reform (ECR) has caused a 36% drop in licensing volume and has created a disparity in the volume of cases among the current divisions. Since 2013, DTCL has also experienced some downsizing through attrition. The new organizational structure will be leaner and will appropriately balance personnel and commodity volume to reflect the post-ECR environment while enabling DTCL to work toward meeting the directorate’s strategic goals. 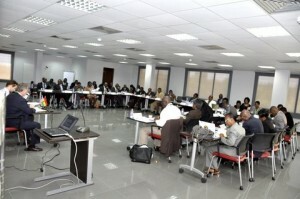 CTP was proud to oversee the first West African Anti-Corruption course at our new Regional Training Center in Accra, Ghana, welcoming delegates Ghana, Nigeria, Sierra Leone, Liberia and Tanzania. The goal was to discuss the impact of local and international anti-corruption and bribery legislation and its enforcement in West Africa. This three-day event in Lisbon, Portugal brought together Maritime security experts from Europe and the United States to discuss the best practices and results of the radiation screening efforts conducted under the 2nd Line of Defense/Megaports program. Experts speakers and panel discussion were featured in both plenary and break-out sessions, and one day was devoted to on-site demonstrations of screening equipment currently active at the Port of Lisbon. This event, held March 23-27, 2011 was the third in a series of Megaports conferences organized by CTP, with prior events in Dominican Republic and Thailand.